In the traditional Chinese culture, seven represents the combination of Yin, Yang and Five Elements (Metal, Wood, Water, Fire and Earth). This combination is considered as “harmony” in the ideology of Confucianism. While in Chinese Taoism, it stands for Tao which has a close connection with kindness and beauty. I look forward to harmony and a close connection with kindness and beauty in the upcoming year of my recovery. I am constantly trying to find the balance of kindness in my rehab. How far can I push my body and when do I just need to sit back and recover. Most of the time I just make up my rehab as I go, circling back around to the exercises that I have done in previous years and enjoying the differences in my strength and ability. To say that this process is slow is an understatement, this progress is painfully slow, but I am here and ready to face it and I am encouraged by my strength that continues to grow. my situation end up in the hospital and some don't make it out. It's a constant battle to survive, not to mention the huge financial burden that weighs on me heavily. My number one focus is my health and it has to be that way because nothing terrifies me more than ending up back in the hospital. It is easy to end up with pressure sores or other issues related to quadriplegia, it is hard to fight this battle and stay strong. It all starts with having proper care and people that understand. This summer I had three caregivers in the matter of two months give me their notice. It turned my world upside down and my entire focus had to go to finding new caregivers that could help get me through my days. Through this journey I have met so many amazing people, true angels that allow me to live. It really is beautiful and humbling and gives me hope in humanity. There is nothing more selfless than being a caregiver and it frustrates me so much that as a society we don't put more emphasis on how important these people are. So if you see me out and about with a caregiver please thank them because they can never be thanked enough for what they do. As lives go on, marriage, kids, travel, play ...I look for my path, a path I can take that will give me happiness knowing that my path will be very different from most. Without my art I would have a hard time moving forward. I still have my art and I thankful for that everyday. My 2018 calendars are available online and we have a new website for Gallery Exposed (links in sidebar). Currently we are exhibiting "See you, See me" a solo show with photographs by me up through December 31st, if you are in Carmel please stop by! On the cover of Monterey County Women magazine. It doesn't seem so long ago that I woke up at my house in Big Sur, ate breakfast, watered my garden, fed my animals, showered, packed up my Halloween costume and headed into Carmel. It was a Sunday so it was my day to open up the gallery. I remember this day like it was yesterday, my last day of independence. That evening I stopped by the Big Sur River Inn to watch game 4 of the World Series, San Francisco Giants vs Texas Rangers, Giants won 4-0. I changed into my costume and headed to Nepenthe for their annual Masquerade Ball. We danced, we laughed, we enjoyed the beautiful night under the stars....Happy Halloween my friends. My Awesome runners! Running the Big Sur River run last Sunday even though it was cancelled, to start their training for this year's relay for Rachael! I love these guys! Thank you for all of your support! Well, I am one lucky girl! You did it again, we met the goal of $30,000 to help with my caregiving and physical therapy costs after a car accident that left me a quadriplegic in 2010. I can't believe how the energy behind this relay continues to grow and grow every year, it is inspiring and motivating. Thanks for believing in me and being my light. My 19 runners hit highway 1 on Sunday, April 30th in part of the Big Sur Marathon, 3 marathoners and 16 relay runners. Sister/brother duo Shelby and Taylor Hawthorne ran their first marathon and Kodiak Greenwood ran his third consecutive Big Sur Marathon. Relay "Team Nepenthe" came in first, 5 minutes before "Team Carmel Valley", Lee Lightfoot was not happy about this! 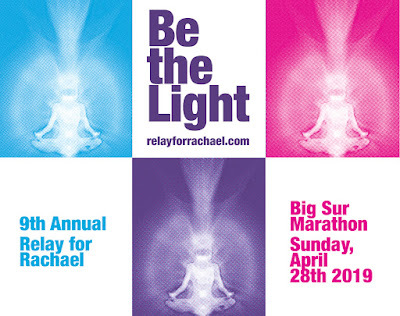 The relay year after year motivates me to keep on going and gives me the funds to do it. I exercise 6 days/week, 4-6 hours a day and Sundays I make sure to stand and stretch a minimum of 1-2 hours. I have to get the movement, I can't imagine not. I am so fortunate for the support that I have and continue to receive. Thank you! My progress is slow but happening! My core and arms continue to get stronger, I am starting to feel temperature change in my legs! About damn time...this growing nerves thing is tricky business. I want to thank my runners, friends, family, communitby and everyone who donated and continues to donate year after year! As well as my friends at the Carmel Valley Athletic Club, Double Portion Supply, Loco Coco, Big Sur River Inn, The Treadmill and VEE R Creative Ventures for their support! The journey continues! The crew celebrating at the finish line. It's that time again! I have a group of amazing runners raising money and hitting Highway 1 on Sunday, April 30th in part of the Big Sur international Marathon. Every year since my car accident in 2010 this has been my annual fundraiser for caregiving and physical therapy costs. I am forever grateful for everyone's continued support! Thank you! Donations can be made HERE! I have finally started collecting my rehab videos over the years! Check them out HERE. Thank you for continuing on this journey with me. Be the Light.